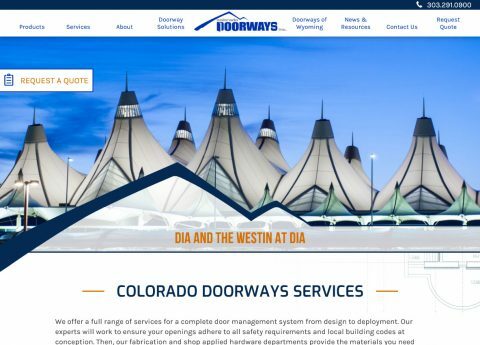 Colorado Doorways’ new website uses the latest online technologies and authoring techniques to provide a modern and up-to-date look.. 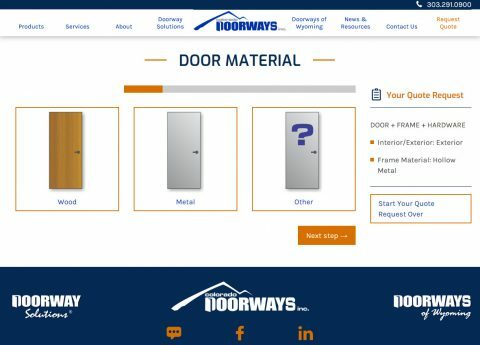 In February 2000 Doorways became one of the first door and hardware distributors to have its own website. Today, we are excited to launch the fifth version of our online presence. Technology has always been a major part in our strategy to not just keep pace with, but instead to stay ahead of the industry. The culmination of this latest nine-month long project reflects our commitment to stay in the lead. Our new website uses the latest online technologies and authoring techniques to provide a modern and up-to-date look. Whether you are viewing it on your desktop computer, your tablet or your mobile phone, you get the full, rich experience. 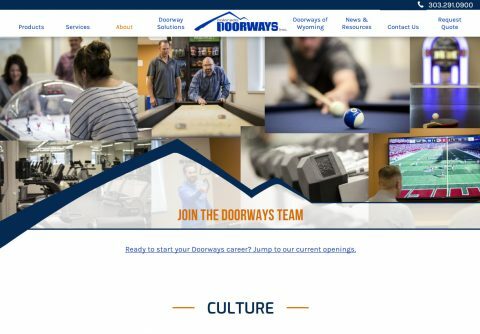 The new DoorwaysInc.com isn’t just another pretty online face. Spend some time looking and you will see some cool things and learn a lot about how we can help you and your projects. Build your door and get a quote, all online, with our new Quote Builder System. Perhaps most notable is our new online Quote Builder system. This is a quick and easy way to pick the doors, frames and hardware you are looking for and send it off to our experts for a quote. We have to say it is kind of fun to use too. Check it out. We’ve added a new page dedicated to our Shop Applied Hardware service. You’ve never heard of it? Then you are missing out on this time and cost saving innovation that gets you your doors ready to hang with the hardware already installed. Learn more here. You probably already know that Doorways is the Rocky Mountain region’s largest supplier of all components of the architectural door opening. We’ve come a long way since 1973 and our new facility is a site to behold. Learn more about us, our main location here in Denver and how we can help you with your next project. Looking for a career? Doorways may be the place for you. Doorways would not be where it is today without the extraordinary dedication of our employees. We are proud of the reputation we have as a desirable employer with many men and women that have been here for decades. We also seek out newcomers to the industry by offering innovative amenities and benefits, education and more. See why we are so sought after in our new careers section – and why you might want to join our team. Finally, we are going to be a lot more proactive in keeping you, our customers, up to date with what we have going on. Our new news section coupled with our Facebook page will be regularly updated and be a fun way to interact with us. Take a look around the DoorwaysInc.com and let us know what you think. We’d love to hear your thoughts and of course help you with your next project. We would like to thank Zenman, our web developer, for their team’s hard work in bringing this site and our vision for it to life. We made a great team and we hope the results show!